I've always drooled over pretty photos of people's perfume collections. I'd wish that someday I would have something like that to show off but I later on figured that I probably wouldn't get to. Buying a bunch of perfumes was never really ideal to me. Mostly because I'm really picky with my fragrances and I just can't justify spending a wad of cash on a small bottle of liquid. When I find a perfume I really like, I just buy the rollerball version since it's travel friendly and doesn't really hurt my pocket. But then I found a subscription service called Scentbird. 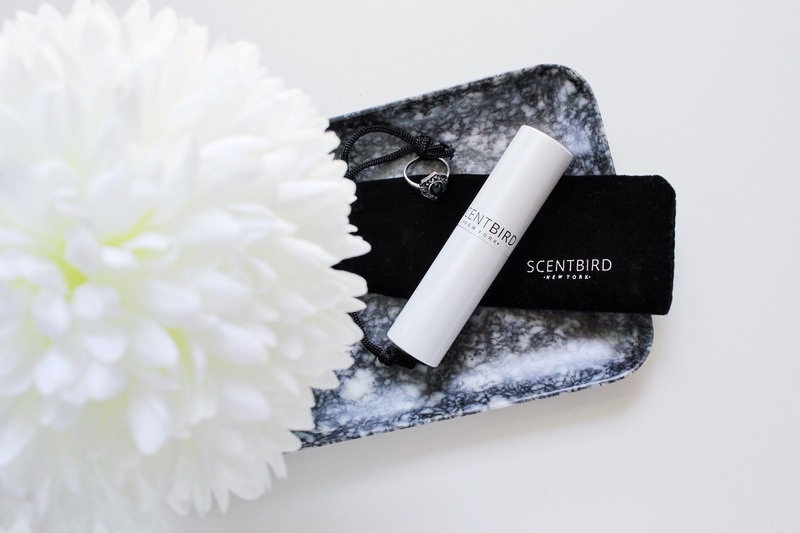 With Scentbird, I could pick out different scents each month to test out for a low price ($14.95CAD/mo.). They have over 450 designer and niche fragrances to choose from. If you ask me, a designer fragrance for less than $15 is a great deal, especially since the vial comes with a more-than-decent amount of product (claims to be ideal for 4 sprays a day for an entire month). The scent comes in a refillable case with your first order. I really like that it's compact and travel friendly. It's also really sturdy. The case is built like a tube of lipstick. When you twist it, the spray nozzle pops up and to retract it, you just twist it the opposite way. The default case with every subscription is their pearly white shade, but you can buy different coloured cases on their website. For my first scent, I picked out Stella by Stella McCartney*. It is described on the site as "a rose in full bloom in a traditional English garden with a sultry amber contrast". I absolutely love anything that is rose scented and this scent really hit the spot! It smells really amazing and I'm thinking of buying a full size or I may just get a refill from Scentbird since it'll probably save me money. Overall, I'm really intrigued by this company. On their website, they have a little blurb that says "Date perfumes before marrying them". I think that motto describes their brand perfectly! You get to sample different scents before you decide to fully commit to them. This subscription is great if you're picky with your fragrances, like I am. But with their big range of different scents, I'm sure you'll find the right one! What do you think about this company? What's your favourite perfume? Products marked with a (*) were sent to me for consideration.